balanced equation for the reaction. Download balanced equation for the reaction. 414 J of heat. What is the specific heat of this sample? raise the temperature of a 321-g sample by 18 C? 541 g of aluminum by 13 C? 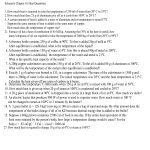 what are the units for specific heat capacity? 1.89 J/goC after 1800 J of heat energy is applied? a) What is the change in temperature of the brick? absorbed 900 J of heat. What is the specific heat of this sample? temperature of the mixture is 33.0°C, how much heat (in kJ) is released in the reaction? Assume that the densities of the solutions are 1.00 g/mL. heated from 15°C to 40°C. temperature of a 300.-g sample by 10. C?